This morning, several children and adults participated in a dramatic reading of a script written by John Morris and ably directed by Elizabeth Gelfeld. 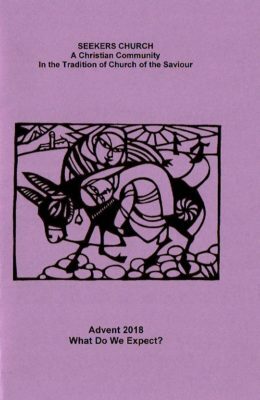 The script of Nunc Dimittis: An Elder’s Advent, based on Luke 2:25-38, follows. Setting: The Temple. ANNA is standing alone, head bowed, lips moving in prayer. SIMEON enters, carrying a ledger. ANNA: Oh, you startled me. (Squinting) Is that you, Simeon? My eyesight isn’t so good anymore. SIMEON: Of course it’s me, Anna. Don’t I come to the Temple every day at this time? ANNA: Yes, you do. You’re still waiting, are you? ANNA: Because God told you you wouldn’t die until the Messiah comes. ANNA: Hi, Rachel. (Rachel waves and keeps sweeping) Let me ask you something. (Rachel stops sweeping and gives her his attention.) Do you believe in the Messiah? ANNA: Well, what do you think the Messiah will be like? RACHEL: Gosh, I guess the Messiah will be a powerful soldier. He’ll raise an army and drive out the Romans. ANNA: And what will happen next? RACHEL: Next? Why, the whole world will see that our God is the one true God, and the people of God will be exalted for ever and ever. ANNA: Fair enough. When do you suppose this is all going to happen? ANNA: How long have you been waiting, Simeon? SIMEON: (consults his ledger, performs a few calculations) Ninety-seven years. And three months. ANNA: I see. A considerable wait, then. SIMEON: Yep. (Pause) And what about you, Anna? Still living here at the Temple? ANNA: I know it sounds foolish, but I feel closer to God here. What RACHEL just said . . . I suppose he might be right, but somehow, spending all this time in God’s holy place, I don’t think the Messiah is going to be a soldier . . . What if the Messiah is something completely different, something we’d never expect? SIMEON: Like what? (Sarcastic) Oh, I know: it’ll be some yokel from the sticks – you know, some flea-pit like Nazareth. ANNA: Don’t make fun of me, Simeon. I’m just saying I think the Messiah won’t be anything like what we imagine. (She arranges her hair and scarf a bit) Did you know I was a widow, Simeon? ANNA (coyly): And I’m only eighty-four. SIMEON: How long ago did your husband die? ANNA: (consults her fingers, performs a few calculations) Never mind. SIMEON: Someday, someday. . . I’m so tired, but I can’t take my final rest until the Messiah comes. All good parents have to bring every child here to the Temple, to offer thanks to God. I haven’t missed a single one, I’ve checked them all out. I mean, they’re very nice babies and everything, but (shakes his head) . . . not the one. The Messiah has to be a king! I suppose when the Messiah does come, there’ll be trumpets and priests and fancy clothes and all sorts of regal carrying-on . . .
SIMEON and ANNA: Now what?? ANNA: They think this child is the Messiah! SIMEON: Oh right. Very likely, I’m sure. ANNA: Well, go look. You said you looked at them all. SIMEON: Fine, then maybe they’ll leave us in peace. (He walks to MARY) Young lady, would you mind if I had a peek at your beautiful baby? Just humor an old man . . .
MARY: Please do! He’s gorgeous! SIMEON: It’s . . . it’s the one! SIMEON: This child is Messiah! (Raising his arms and eyes to Heaven) Holy One, finally, let me come to you as you promised! Call me home! Dismiss your servant in peace! My eyes have seen the Child you have sent to be the salvation of your people! MARY: Sir . . . sir? I think you’re having a bit of an episode. This is only my newborn son, Jesus. JOSEPH (to MARY): But Mary, don’t forget what those shepherds told us. And the wise men who came to see us that night? ANNA: So there have been other signs and prophecies? 2nd CHILD: And there we were, in the stable with Mary and Joseph and the baby. 3rd CHILD: And three wise men showed up. They brought gifts, and said the baby would be a king! MARY: I’ve never told this to anyone else, only Joseph. But when I was pregnant, I saw an angel too. She told me not to worry about having a child even though I’d never . . . (she looks around at the interested children)…well, that part doesn’t matter. The angel said my child would be called the Child of God, the most special child ever born. Well, all I know is, my child is special to me. I could love no one more. SIMEON: May I hold him? (He takes the baby, gazes at him. Then, to MARY): Your child will be the light, yes, but darkness will strive against him too. Swords will be raised, and your own heart will be pierced. ANNA: Simeon, that’s enough! This is a time of joy, not grief. JOSEPH (to the children): Whoah, I think you have to stay out here. ANNA: Should we have gone, too? SIMEON: Probably not. That was already quite a crowd. ANNA: So, your wait is over. SIMEON: Yep. In fact (with a sudden burst of enthusiasm): hallelujah! ANNA: You’ve seen the Messiah. We’ve seen the Messiah. SIMEON: You believe it, too? You trust my prophecy? ANNA: Well, I’m sure you’re a very good prophet. But the fact is, I have had my own dreams and prophecies. My crone wisdom has been speaking to me. Yes, I know from my own heart and the voice of the Spirit that Mary and Joseph’s baby is the Messiah. You see, I knew staying here at the Temple would bring me closer to God. (Silence. She regards him speculatively.) Do you think the Holy One is going to call you home right away? SIMEON (a bit flustered): Well, maybe not right away. But I am ninety-seven. And three months. ANNA: But probably not before this afternoon? SIMEON: I suppose not. I mean, I feel fine. ANNA: Care to join me for lunch in the marketplace? SIMEON: Really? I haven’t been on a date in (consults his ledger) forty-three years. ANNA: Well, it’s about time, then. There’s a good falafel stand.